Belkin Cooks Up New iPad Dock for… Chefs?! I never really thought there was a huge demand for specialized docks for chefs and other folks that like to cook. My grandmother loved to cook and she didn’t need a recipe at all, she just knew what to do. I thought all chefs were the same way. I try to keep my iPad out of the kitchen so it doesn’t get spilled on so this is a bit strange to me. 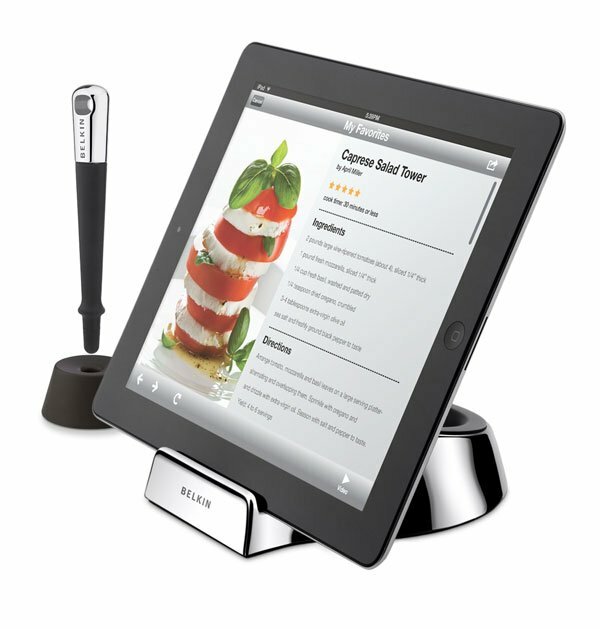 Belkin has a new iPad 2 stand that is specifically made for the kitchen. The case has a shiny hand washable surface and is kitchen safe. The stand is called the Chef Stand + Stylus, and it sells for $39.99 (USD). The cute little stylus looks like some sort of kitchen utensil minus the utensil part and it has a magnetic tip. The magnet in the tip is the key to using the stylus and allows the navigation of the tablet with dirty hands. The stand also has a non-slip base to help keep your tablet from sliding around. The stand will work with a case on your iPad 2 and it should also work with most other tablets. Along with the Chef Stand, Belkin also announced two other special kitchen accessories, including an under-cabinet mount as well as a refrigerator mount for the iPad.